The Sealy peers out at the world from beneath bushy eyebrows, ever curious about the goings-on around him. 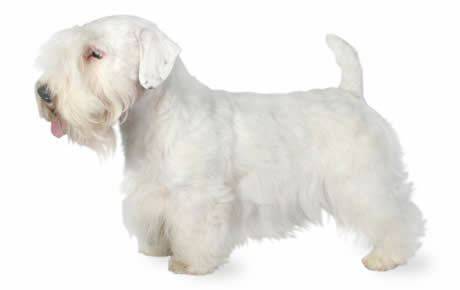 Although he certainly has the look of a feisty terrier, the Sealyham Terrier doesn't have the typical attitude. He's a very mellow, laid-back dog, with modest exercise requirements and a clownish spirit. He even gets along well with other dogs. All these traits serve to make him a good pet for someone who loves the high-style look of a terrier but isn’t enamored with or capable of handling that in-your-face kind of dog. The Sealyham Terrier is all terrier on the outside, with the scruffy charm of his cousins and the white color of his ancestor, the West Highland White Terrier. But on the inside he's a very different dog. Originally bred to hunt badger, he's better described as a lover, not a fighter. He's a playful dog with a big sense of humor, and while he has a tendency to bark a bit more than most people might like, at only 20 to 25 pounds he is the perfect size for an apartment. He's a light shedder, inclined to be child-friendly and dog-friendly, and doesn't even have an overwhelming desire to chase cats. 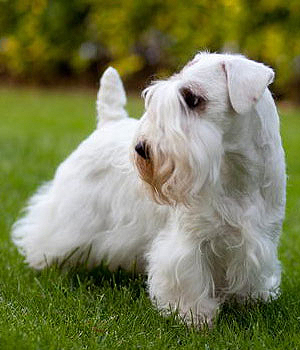 The Sealyham’s long, broad head and rectangular body are two of the features that differentiate him from other terriers. The Sealyham’s double coat can be all white or white with lemon, tan or badger markings on the head and ears. “Badger” is a mixture of white, gray, brown and black hairs. An independent dog, the Sealy is perfectly fine with being left alone while his humans work but he is also thrilled to snuggle up on their laps when they get home. 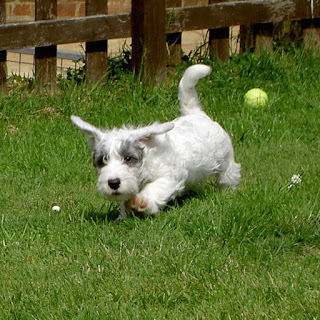 This breed does tend to be relentless barkers however; they are not quite as bad as other terrier breeds. Their personalities and clown-like antics will keep the family laughing for hours. The Sealy might be small but he doesn’t understand the concept of this. Because he can be food and toy aggressive, this breed is not appropriate for families with young children. Considering his strong instinct to chase, he should not live with cats or other small animals. If raised with another dog in the home, the Sealy will get along famously with it, but can be aggressive toward strange dogs. This is a hardy breed with few breed specific health problems. 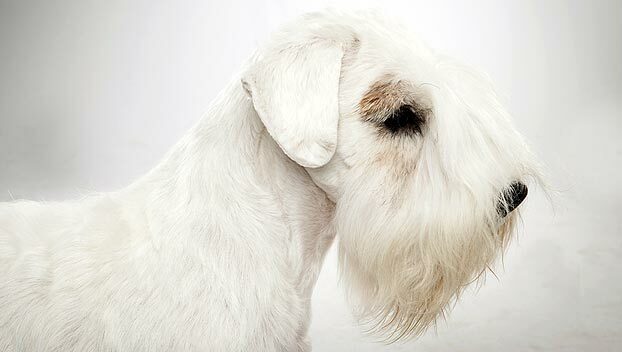 The main hereditary problem highlighted by the American Sealyham Terrier Club is an eye condition called lens luxation, for which there are DNA tests. Lens luxation is a condition in which the lens slips out of position in the eyeball due to the weakening of the fibers that holds it in place. This in turn blocks the flow of fluids in the eye, leading to a painful increase in intra-ocular pressure glaucoma and often irreparable optic nerve damage, leading to visual field loss and eventual blindness. As of November 2011, the Kennel Club has not highlighted any specific concerns regarding the breed's health to conformation show judges. 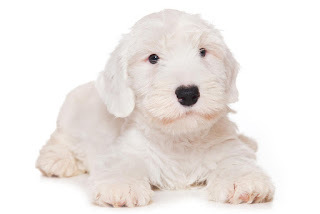 Due to the low numbers of the breed, two of the most prevalent problems facing the breed today is the popular sire effect and the general problem of genetic diversity within the breed. 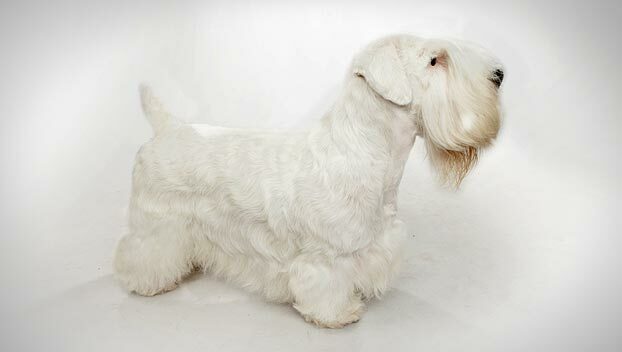 Sealyham Terriers are feisty and strong-willed dogs. They require an assertive but kind family that won’t let the dog walk all over them. The Sealy needs regular training sessions to keep him from misbehaving. Consistency, along with loads of praise and treats, is best when working with a Sealy. Training should begin from the time you get the new puppy. This should go on throughout the dog’s life to ensure that he never forgets his place within the family. Sealies were bred to hunt small animals so they do remarkably well at Earthdog competitions. Being the mellowest of the terriers, this breed can be wonderful therapy dogs as well as family companions. Of course, with a lot of hard work, the Sealy can do well in obedience trials as well as in the breed ring. This breed needs a daily walk. Play will take care of a lot of their exercise needs, however, as with all breeds, play will not fulfill their primal instinct to walk. Dogs that do not get to go on daily walks are more likely to display behavior problems. They will also enjoy a good romp in a safe, open area off lead, such as a large, fenced-in yard. The breed is a low-energy dog that makes a good walking companion. The overriding characteristic about Sealyhams is that they are low energy, couch potatoes. They are not "busy," not "active" and therefore make a low-key companion. The Sealy has a long, weather-resistant double coat that doesn’t shed much but requires stripping or clipping in addition to regular brushing or combing with a slicker brush, pin brush, or stainless steel Greyhound comb. Be sure you brush or comb all the way down to the skin. The beard requires daily combing to keep it clean. The Sealy doesn’t shed much at all, but his hard terrier coat may need special care. If the show ring is in his future, the Sealyham's coat will have to be “hand-stripped,” a labor-intensive task that involves pulling out dead coat a little bit at a time, using a special tool. 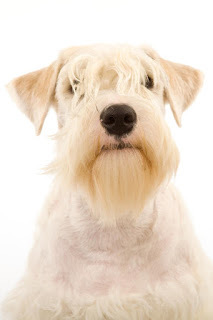 Dogs whose career involves your sofa and garden will simply need to be kept brushed and occasionally clipped for neatness and to minimize shedding and matting of the coat. Clipping will soften the texture of the coat, so think about whether that’s important to you before you have it done. The Sealyham is named after the estate of the man who developed the breed, Captain John Edwardes, who lived in Wales.